In January NEMS launched its first community project. 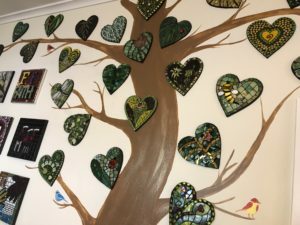 Over 30 members made mosaic leaves from templates provided by Amanda Edwards. Amanda and crew installed these mosaics on a mural at the Ronald McDonald House in Portland, ME. We visited the installation in early June as part of a Portland, ME mosaic tour. 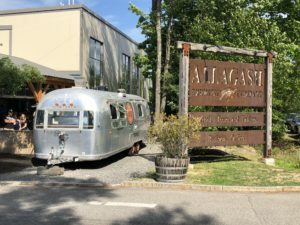 The tour started at Amanda’s Studio in Cape Elizabeth, Maine with light refreshments and a meet and greet. 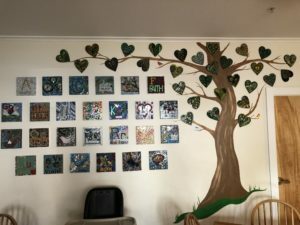 From there, participants visited the Ronald McDonald House (RMH) where they went on a special tour of the facilities and viewed the tree mural with heart-shaped leaves created by NEMS members. The mosaics in the mural were awesome, as you can see from the great pictures taken by Su Bailey. But that’s not all. 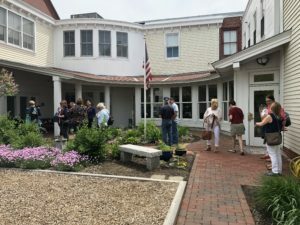 From RMH, everyone headed to downtown Portland for lunch and a walking tour of Portland’s Old Port and Art’s District lead by Amanda. 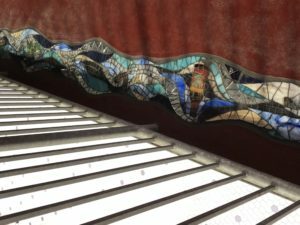 The program ended at Allagash Beer, where Amanda installed a 92′ floor mosaic along the mezzanine overlooking their bottling facility. Everyone had a great time touring the facility and, of course, tasting the beer.